Learn the basic steps for making Whisky. Making whisky is not necessarily a complicated process. In essence you make some beer, remove most of the water from it and stick it in a cask for a bit. The tricky bit is trying to make it taste good and not harming anyone along the way, either by poisoning or explosions. To briefly understand how to make whisky it is easiest to break it down into six stages; malting, milling, mashing, fermentation, distillation and maturation, however each of these stages can be further dissected into smaller stages again. There are many different ways to approach the entire process so for the most part here we will be discussing the processes for Scotch malt whisky. This guide is designed to give you an idea of the basic concepts behind making Scotch whisky and where a lot of the flavour originates. Freshly steeped barley at Port Ellen Maltings, Islay. To make the initial alcohol for whisky a reliable source of carbohydrate or sugars is requied. For whisky the law dictates that these must come from cereal grains such as barley, wheat, rye or corn. Cereal grains contain a rich supply of carbohydrate arranged into long chains called starch which they store as a food reserve for the regeneration of the plant. Yeast, see fermentation, cannot use the longer chain starch to produce alcohol, so these chains must be broken down. Fortunately the grain will achieve this through the natural process of germination. As the grain begins to grow a root and a shoot, it stimulates the production of plant hormones which in turn stimulate the production of enzymes. An enzyme is simply a catalyst that brings about a specific biochemical reaction. It is these enzymes that break down the starch into shorter carbohydrates or sugars to be used as a fuel source for the sprouting plant. If this is not undertaken in a controlled manner the grain will exhaust all of the sugar reserves during the process of growing. Floor malting barley at Bowmore, Islay. Drum maltings at Port Ellen, Islay. Germination is stimulated by repeatedly soaking the grains in water, called steeping. The grain is then either transported to a rotating vessel through which moist air is blown to control the temperature, called drum malting, or it is spread over a concrete floor in the more traditional system called floor malting. It is important to frequently agitate the grains to prevent the emerging shoots from matting together and causing excessively hot conditions. This process is called germination and will continue for around 4-6 days to allow the grain to produce the correct enzyme levels and begin the action of breaking down the starch into sugars.. Dried peat going into the kiln. At just the right moment the germination is halted by removing most of the moisture from the grain through a heating process called kilning. The heat is supplied either indirectly with hot water or steam radiators or directly with peat furnaces or oil burners. The crucial elements here are temperature control and time. The burning of peat will create that distinctive smokey character famous among Islay whiskies. Peat smoke contains chemicals called phenols which are the ones responsible for the smokey flavour. The timing of the peat during kilning is essential as the phenols will only attach to the grain within a specific range of grain moisture content. Once the grain becomes too dry the phenols will no longer attach themselves. When the grain has been dried it becomes a stable product containing all of the building blocks for alcohol creation. Some distillers, particularly in Ireland, choose to use green malt which has not been stabilised through kilning. 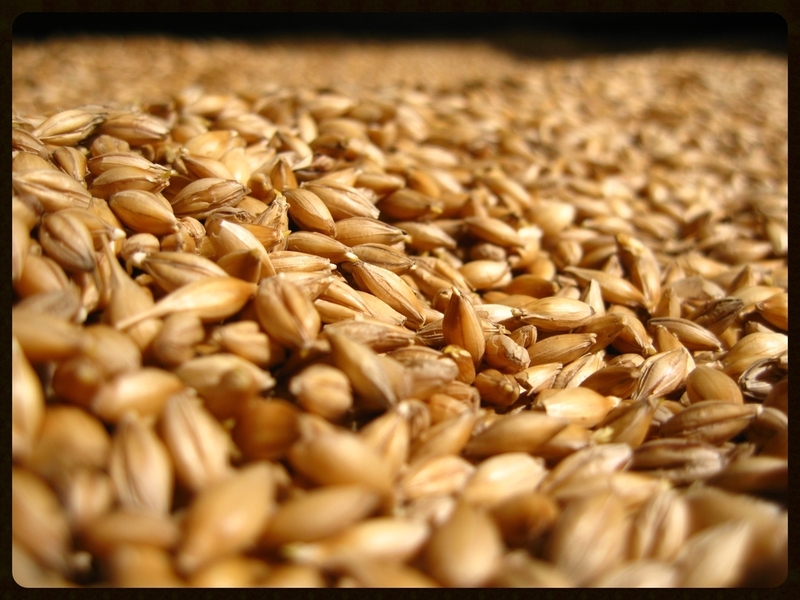 Green malt has a higher enzyme content but has a very limited storage time as it will continue to metabolise. Porteus, the legendary mills in many Scotch distilleries. The grain must be crushed to free the starch and enzymes from the cell walls in preparation for mashing. This is achieved through passing the grains through a mill containing metal rollers to produce a course flour called grist. The quality of the grist or crushed grain is essential. Grist that has not been crushed sufficiently will not have the starch exposed as it will remain locked within the cell walls preventing conversion into sugars. Grist that has been crushed too finely will clog the system when water is added during mashing. Imagine adding water to a bag of flour, it will create a thick dough. The three elements of the grist are the finest parts called flour, the middle parts called grits and the coarse parts called husk. It is the percentage of each of these three parts that will determine the grist quality. The process of breaking down starch into sugars was started during malting and was stopped when the grain was dried during kilning. This conversion is now started once more when water is reintroduced to the grain, now in the form of grist inside a large vessel called a mash tun in a process called mashing. The objective of mashing is to extract as much of the sugar from the ground grains as possible and collect them in a soluble form as a sweet liquid. Steel mash tuns and wooden wash backs at Ardnamurchan Distillery, Scotland. Water is added to the grist at just the right temperature to preserve the important enzymes but to also gelatinise the malt starch to aid its further conversion to sugars by the enzymes. After a period of resting and usually stirring, the resulting sugar-rich liquid called wort is drained away leaving behind the solids of the grist. The grist will still contain some residual starch, sugars and enzymes however so water will be mixed with the grist and then filtered away a further two times. The final wort that is drained away will be separated and used as the first water for the next fresh batch of grist. The wort will then be collected and pumped into a large fermentation vessel called a wash back. Wash backs are the huge wooden tanks that distilleries are often proud to show but are also commonly made of steel. Now that we have a nice sugar rich liquid it is time to introduce a handy wee microorganism which dedicates its life to converting sugars predominantly into alcohols and carbon dioxide. The microorganism is of course yeast. Different strains of yeast cells are all around us, in the air, on our skin and on the surface of fruit for example. Whilst some fermentations rely on naturally occurring yeast, most distillers use cultured yeast, the most popular of which being saccharomyces cerevisiae. Cultured yeast strains allow the distiller to have consistency over the supply of yeast, a predictable alcoholic yield and control over the flavours that are created by the yeast. Old wooden wash back at Bowmore, Islay. Yeast does not intentionally produce alcohol but the cell extracts energy from sugar in order to grow and/or remain alive and passes alcohols and carbon dioxide out as waste products. The yeast cells absorb the sugar through their cell surface and convert it internally into alcohol and carbon dioxide by using their own enzymes. 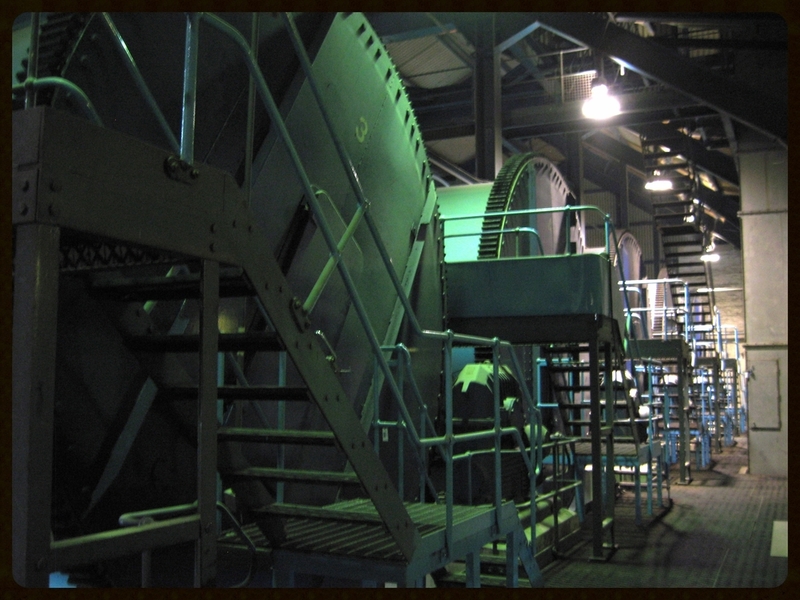 This is the same process that produces wine, beer, cider, rum and any other fermented alcoholic drink you can think of. The length of fermentation will be dependent on the yeast strain, temperature of the fermentation, the quantity of yeast added and of course the levels of nutrients present. Another important factor that will effect fermentation and yield of alcohol is if the yeast is added as dried yeast, re-hydrated yeast or liquid yeast. For Scotch whisky production fermentation times generally range between 48 hours and 96 hours. The resulting fermented liquid will now be around 8-10% alcohol by volume and is called wash.
Fermentation is a crucial stage in the process not only because it produces the alcohols but also because it develops other key components such as fusel oils and esters. Esters are a group of chemicals that add fruity notes to whisky such as ripe melon, pineapple or pear flavours. When you think of a whisky distillery you think of shining copper stills, the 'business' end of production. Up until now we have followed very similar steps to those used for beer production. The skill of the distiller is to then refine the product into a much higher alcoholic strength liquid by separating the components (predominantly alcohol and water) through boiling to produce a vapour, and then condensing and collecting the vapour. Pure alcohol evaporates at 78.5ºc whereas water evaporates at 100ºc, so logically if you heat a liquid containing the two up to around 78.5ºc the alcohol will begin to evaporate and leave behind some of the water. The vapour is then condensed to produce a liquid that now has a higher alcoholic strength. Still, lyne arm and condenser at Chichibu Distillery, Japan. For Scotch malt whisky this is undertaken as a batch process. The large copper stills operate like giant kettles, most commonly heated with steam traveling through pipes inside the still but occasionally the base of the still is heated directly with a flame, although this is quite rare these days. Inside the still the wash is heated until the alcohol begins to evaporate and rises up to the neck of the still, eventually reaching the very top. The vapour then travels along a tube called a lyne arm that carries it away from the still and into a condenser that will cool the vapour back into a liquid, where it is then collected in a spirit receiver. There are two basic designs of condenser, shell & tube and worm tub. Shell & tube condensers consist of a series of small tubes encased within one large tube. The vapour passes through the smaller tubes and cool water is pumped around them within the large tube, thus cooling the vapour. Worm tubs are simply a single copper tube that extends from the lyne arm and spirals its way through a vat of water. The vat of water cools the copper tubing and therefore cools and condensers the vapour within. Stills at Caol Ila, Islay. 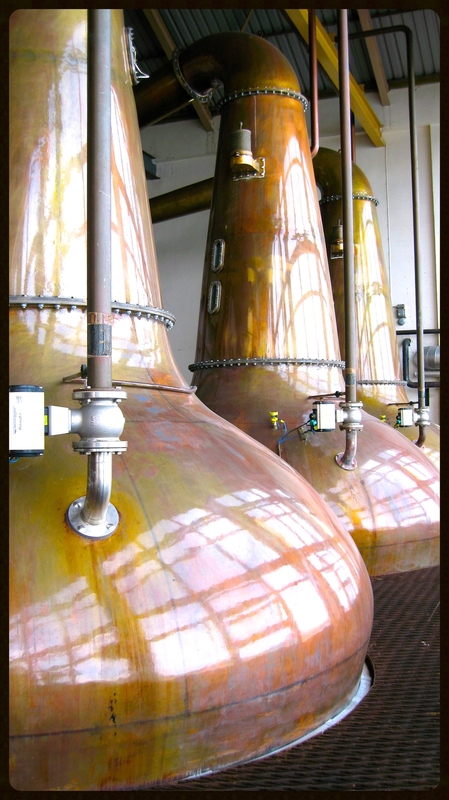 Scotch whisky distilleries often operate stills as pairs, the wash still and the spirit still. The wash still is for the first distillation of the wash, hence its name. The condensed vapour that is collected from the wash still will be on average around 25-30% alcohol by volume and is called low wines, however it is not yet high enough in alcohol for Scotch whisky. 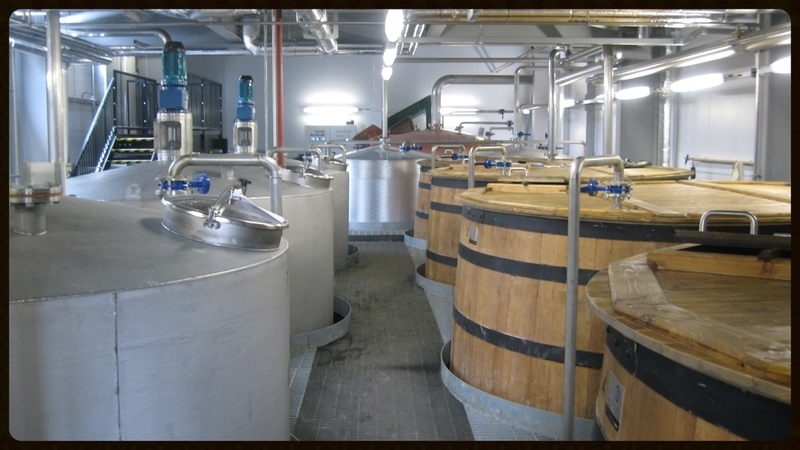 The low wines are collected and then undergo a second distillation in the usually smaller spirit still. The resulting condensed vapour from this distillation will then be around 68% alcohol or higher, although it varies greatly, and is called new make spirit. Stills at Cotswold's Distillery, England. Of the vapour that comes from the stills not all of it is fit for drinking however. The first portion of vapour at the beginning of the distillation is called the foreshots or heads and contains an off-putting quantity of esters plus also harmful chemicals such as methanol. The last of the vapour that will leave the still is called the feints or tails and will contain undesirable amounts of heavy, earthy aromas and little alcohol. The part of the distillation that is retained for filling into cask is called the middle-cut, spirit-cut or hearts. This is the colourless liquid that will become whisky one day. It is the decision of the distiller to dictate exactly at what point in the distillation process they will begin to collect the spirit-cut and at one point they will cease to collect it. This is a decision that will play a huge role in dictating the style of the new make spirit. Copper is used as the material for stills as it is easily malleable to create the stills and most importantly it reacts with the vapour during distillation. During this reaction impurities from the the vapour begin to be removed to produce a much more pleasant character in the finished spirit. The more copper contact the better, which is why the stills, the lyne arms and the condenser tubes will all be made of copper. The stills are designed in a way that encourages some of the vapour to condense on the inside of the still neck itself and trickle back down to be re-vapourised. This process is called reflux and helps with the process of purification. Some distilleries will use a third distillation for all or just part of the spirit collected from the second still. Each time the spirit is distilled it becomes more pure, lighter in character and higher in alcohol. To be classed as Scotch malt whisky the final spirit cannot be distilled higher than 94.8% alcohol by volume as the spirit will be so pure that it will contain very little character from the raw ingredients of barley, yeast and water. The regulations state that Scotch whisky must use a method of production 'that retains the colour, aroma and taste derived from the raw materials used in, and the method of, its production and maturation'. The new make spirit has been created and is ready to be filled into casks. This is undoubtedly the largest contributing factor to whisky flavour and can either make or break a whisky. Before filling into cask the new make spirit will be diluted with de-mineralised water, most commonly down to 63.5% alcohol by volume. Casks waiting to be filled with new make spirit. To carry the badge of Scotch whisky the wood used for the cask must be oak and the full maturation must be completed in Scotland for no less than 3 years and a day. Oak has the characteristics of being readily available, it's strong and flexible for effective coopering, it's relatively water tight and it helps to remove unattractive flavours from the spirit whilst adding pleasant flavours and colour. 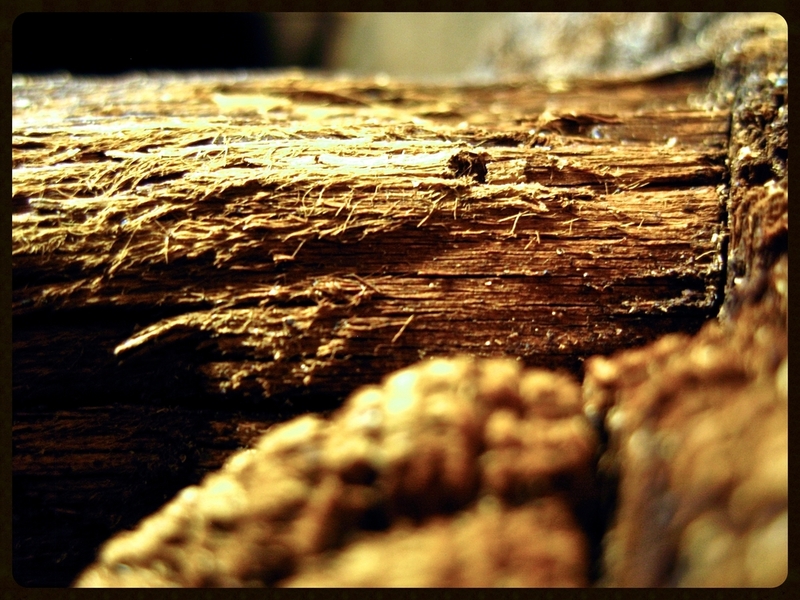 All of the colour and the majority of the flavour in whisky comes from the wood. Even the finest quality spirit will not make a good whisky if it has not be aged in good quality oak casks. Out of the many species of oak it is primarily American oak (Quercus Alba) and European oak (Quercus Robur) that have the best balance of characteristics for the maturation of whisky. American oak casks are by far the most popular due to the fact that they are readily available as a bi-product of American whisky production, chiefly Bourbon. These casks are characterised by the vanilla and coconut flavours they give to whisky. The more expensive European oak requires greater care when cutting, seasoning and coopering and will deliver richer, more tannic notes to a whisky. The most popular size casks are barrels (200 litre), hogsheads (250 litre) and butts (around 500 litres). Traditionally stacked casks at Chichibu Distillery, Japan. A new and previously unused cask will contribute intense wood flavours to the whisky that although favoured by Bourbon whisky producers can be too dominant for Scotch. Scotch whisky producers therefore have a preference for casks that have been previously filled with another liquid to strip some of the intensity out of the wood. As mentioned ex-Bourbon casks are the most popular due to their availability and cost, however ex-Sherry casks also play a huge role and to a much lesser extent ex-wine or rum. Bourbon casks are always made from American oak as are a great deal of ex-Sherry casks. Over it's time in the cask some of the spirit will escape through the cask walls due to the wood's porous nature. This evaporated spirit will be lost forever and is famously known as the angels share. It is the porous nature of the wood that allows the spirit to extract flavour and colour as the cask literally breathes with the changes in ambient temperature and humidity. Each cask is unique and will contribute a very particular range of flavours and colours to a whisky. How many times the cask has been filled previously, the size of the cask, the age of the cask and where it is stored will all determine the final flavour of the whisky. When the time is right the whisky will be bottled or blended, most commonly diluted down with water to a reduced strength. Along with adjusting the alcoholic strength of the whisky the producer can colour it with spirit caramel and also decide whether to chill-filter the whisky to remove oils that can cause cloudiness when water or ice is added.